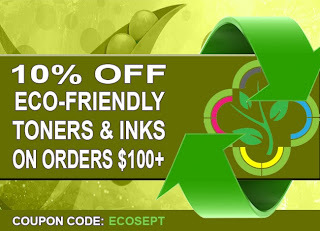 Save 10% Off Eco-Friendly Toners and Inks | TonerGreen - Eco-Friendly Toners from the U.S.
Want to save on your laser toners and printer ink cartridges? 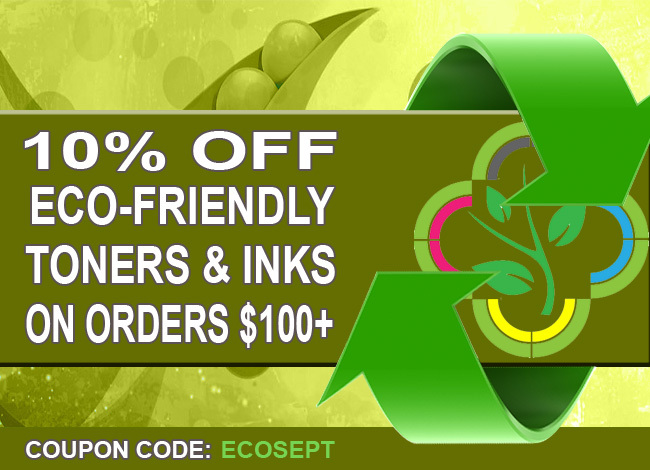 Then get our eco-friendly, US-made remanufactured ink & toner cartridges with 10% Off with no minimum from now until September 12 with our September 10% Off Sale Promo. All you have to do is to type-in TonerGreen discount coupon code ECOSEPT on the coupon code box located at the checkout page. As always, orders $50 and up qualify for free shipping. For orders $49 and under, get your supplies shipped for $6.95 flat rate.This offer is not valid on OEM products. Aside from this promo, TonerGreen also gives a 10% off discount on orders $50 or more by simply liking TonerGreen Official Facebook Fan Page and redeeming the special coupon code to get the discount. We also offer a 10% Off $300 Order Deal, an all-year around discount promo for customers whose purchased order will reach the amount of $300 or more. To avail this discount just use coupon code TENOFF300. Shipping is free, of course, in this promo. You can also check TonerGreen Coupons Page for more discounts and promos. TonerGreen's main product line includes U.S.-made remanufactured toner cartridges and ink cartridges that went under extensive remanufacturing process and several quality tests to ensure they meet the qualifications and standards that the printing industry have set by OEM-branded cartridges. Our extensive selection of eco-friendly printing consumables includes compatible replacement cartridges for printer brands: Brother, Canon, Dell, Epson, HP, Konica Minolta, Lexmark, Okidata, Panasonic, Samsung, Sharp and Xerox. TonerGreen is your reliable partner in supplying all your office imaging and printer supplies. We prioritize quality and customer satisfaction over low-costs and cutbacks with our main goal of selling the best products at fair prices for both quality-and-price-wise customers. Moreover, we intend to help you make eco-friendly choices for your home or office with the confidence that you are making a smart and responsible decision over our cost-reduction opportunities, waste-elimination opportunities and reliability and compliance.